Paper presented at a Series of Talks on ‘Irish Freemasonry in the New Millennium’ held in the Provincial Grand Lodge of Antrim Masonic Hall, Belfast on Saturday 30th October 2004. The Grand Lodge of Ireland has the responsibility of maintaining the highly respected standards and traditions of Irish Freemasonry throughout our Lodges here at home and overseas. We must also nurture and support regular Grand Lodges of other Constitutions with which we are in amity. We are an essential component in the maintenance of high standards in the World of regular Freemasonry in conjunction with our sister Constitutions of England and Scotland. During my term of Office as Provincial Grand Master of The Provincial Grand Lodge of Wicklow & Wexford, I became increasingly aware of the poor public perception of our Order. It caused me grave concern. I felt it posed a major threat to our future progress and possibly our very existence. It is almost entirely our own fault that the public see us as sinister, secretive, sectarian and self-interested. We ignore this at our peril. 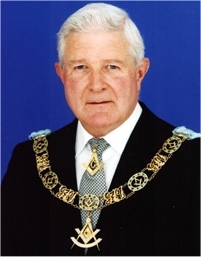 It concerns me that Brethren will talk freely in public about their membership of Rotary, Round Table, Lions, Probus and sports clubs but most will not admit to being Freemasons and indeed many will go to great lengths to hide that fact, which only serves to perpetuate the myth that we are a secret society. If the public do not know what we are, what we do and what we stand for, the result is distrust, suspicion and animosity for which we can only blame ourselves. Freemasonry is totally different to the above-mentioned organisations. There is so much more to Freemasonry than the shallow depth of to-day’s assessment and its scant inspection by to-day’s society, obsessed as society is with the material success of the individual, the trappings of success rather than his contribution to society. It is not readily appreciated that membership of a Lodge teaches many life skills often untaught, or not experienced, elsewhere. A Brother must speak in public, make decisions, vote on issues and finally chair meetings. These are invaluable assets in all other aspects of life and for many this may well be the only opportunity of learning, practising and perfecting these skills and techniques. The Lodge provides opportunities to experience administration, responsibility, ceremonial activity, fund raising and caring. All in an atmosphere of peace and tranquillity and where the increasing turmoil of outside life can be temporarily avoided and batteries recharged to help fit one again for the fray. There have been dramatic changes in society in recent times. There are fewer so-called “9 to 5” jobs. Work practices have changed to the extent that many folk work long hours and often shifts at anti-social times. Both partners work and there is constant pressure on limited leisure time. Do not forget that Freemasonry is a leisure activity which is not in any way frivolous but must always be a rewarding, stimulating and enjoyable experience. Freemasonry is not for everyone but at all times there will be those to whom it will appeal. We must ensure that we maintain a correct and interesting balance in planning our Lodge activities, not placing undue emphasis on either ritual or charity fund raising both of which are essential components in the ethos of Freemasonry. Lodge meetings must be planned to ensure that they are something to be enjoyed and not something to be endured. There is serious concern that American Freemasonry is totally preoccupied with fund raising for non-Masonic causes presumably in a desperate attempt to achieve popularity and reverse the trend of drastically falling numbers. Some years ago I met a visiting American Brother who attended Wicklow Lodge, Installation meeting, he bemoaned the fact that so much of Masonic Ritual had been lost as it travelled across the Atlantic! “On the subject of the Charities, let me remind you first all that Freemasonry itself is not a Charity. Nor does it have charity as its main purpose. Charity is but one expression of the true spirit of Freemasonry, a demonstration to our Brethren and their dependents and to the community that our hearts are indeed expanded by benevolence”. In the past, the Press regularly carried reports of Masonic functions, Lodge and Provincial Grand Lodge meetings, frequently mentioning the names of those installed as Officers. For some inexplicable reason this practice died out and we seemed to retire behind closed doors, unwilling to attract attention to ourselves, again perpetuating the myth of secrecy. Our public profile became almost nonexistent. Tremendous benefits will accrue from informing the public about the true nature of Freemasonry and thereby achieving a vastly improved public image. A major step in this direction was the creation of the Grand Lodge website, an excellent source of accurate information about Irish Freemasonry which can be accessed by the general public and our members wherever they may be at any time. Our website is the envy of our sister Constitutions and reflects great credit on our Webmaster, R.W.Bro. Richard Gray who is with us today. We must try to improve others’ perception of our Order. I firmly believe from that new members will emerge. We must try to correct the false perception of us conveyed by the media and the Churches for they are the agencies who can and do formulate and direct public opinion and both are highly suspicious and even antagonistic. The Churches find it impossible to accept that we are not in competition but that, in fact, we are supportive of religion and encourage each Brother to increase his interest in his own beliefs. We have no theology, do not have sacraments, do not engage as Freemasons in worship in our Lodges and cannot offer the means of salvation through good works or in any other way. It is interesting to note that we have been approached by The Church of Ireland who is interested in holding talks with us so that they may have a better understanding of Freemasonry and our relationship with the Anglican Church. This is encouraging. The first meeting is scheduled for early December. I feel very privileged to have been installed as Grand Master in November 2001. It may seem strange but at no stage was I ever briefed as to my duties or responsibilities. I could act largely as a figurehead, appearing mainly on ceremonial occasions but that is not my style. I am not by nature a passenger. For my own satisfaction I must contribute to the success and add to the momentum of our Order. I made it known that I was prepared to talk to the Media in an attempt to set the record straight and present a very positive public image of our great Order. Appropriate opportunities must be taken to dispel the old myths and focus on the benefits of Freemasonry. Let us identify the positives about our Order, then talk openly about them and try to promote them. This will necessitate across-the-board activities, starting in the home and family, expanding through one’s circle of friends and acquaintances, into the work-place and leisure places – leaving it up to Grand Lodge, of course to deal with the media so that a consistent and coherent message comes across. Following many years of largely ignoring the media, in the past three years we have had significant success in achieving positive media coverage which would have been virtually impossible without the excellent professional PR expertise and support that we received from Bro. Vere Wynn- Jones in Dublin and W.Bro. Trevor Hanna, here in Belfast. PR projects take quite a time to organise and a lot of groundwork is needed to arouse the interest of a newspaper editor or a radio producer. You must be aware that we have enjoyed very positive press coverage of the support given by the Freemasons of Ireland Medical Research Fund over a four-year period to the Cochlear Implant project for young children born deaf organised by the ENT Dept. of the Belfast City Hospital, a wonderful story of Freemasonry working for the good of the community. Just over a year ago, Bro. Hanna was able to arrange for me to be interviewed by David Dunseith on the BBC Radio Ulster ‘Talkback’ programme, I survived the experience and believe that the result was positive. That afternoon Bro Hanna arranged a press conference here in Rosemary Street where I was supported by R.W.Bro. George Dunlop and R.W.Bro. Adam McKinley. Reporters attended from the major Belfast papers and over the next few days we received a lot of coverage which was balanced and mostly favourable. Please bear in mind that we have no control over what is printed and 70% success is very successful. The media will not be interested in trivia so we must bide our time until we have an important and interesting story to tell before we take action again. We are regularly in touch with W.Bro. Hanna who is on the alert for suitable opportunities for media exposure which will arise in the future. Most of our Brethren for years past have been overly defensive about their membership. It is very encouraging for all of us to read or hear something positive in the media about this organisation to which we are so deeply committed. We will feel good and more relaxed and take pride in our involvement which is good for our morale and the continued success of our Order. We must demonstrate to the public, hopefully making our Order more attractive to prospective members that Freemasonry aims to develop the individual as a good citizen and as a man with a good moral foundation. Other benefits to society may follow, but they come from individuals acting in their personal capacities and not as Freemasons. It is not easy in the modern world to convince people that while Freemasonry as a body is not for anything and is certainly not a pressure group, its influence on the personal standards of its individual members must be good for society in general and is to be welcomed. Our greatest critics would like everyone to believe that we are in terminal decline and are engaged in a recruitment drive. The reality is totally different. In its 279 years of existence, the Grand Lodge of Ireland has never embarked on a recruitment drive and it is inconceivable that it ever will. Total membership will always be cyclical. Our numbers reached an unsustainable level during the 1950s and 1960s in the aftermath of the Second World War. To-day total numbers are stabilising and are showing encouraging signs of increase in many areas. Living in South County Dublin, I am very much aware of what is happening among the 36 Dublin Metropolitan Lodges. This month 15 candidates are being processed. This an entirely spontaneous situation and compares with a monthly average of probably two several years ago. Membership in many Provinces has stabilised and in some cases, is on the increase. Our main goal is not to openly seek new members but to improve others’ perception of our Order, from that, I believe candidates will emerge and I feel that this is already proving to be the case. At no stage must we ever compromise on our standards for admission, membership being open to men of integrity, of any religion, who believe in a Supreme Being. I believe that every Brother in every Lodge can play a constructive part in ensuring a successful future for our great Order. In Freemasonry everyone matters. It is up to all of us to decide on the right mix and balance of our activities to maintain the momentum of Freemasonry for our own and future generations’ benefit.